Scientists are redrawing their ‘most pessimistic forecast’ of climate change as an unprecedented heatwave in the winter Arctic is causing blizzards in Europe. 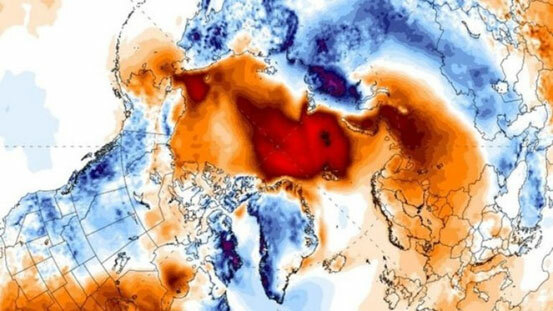 Daily temperatures in the Arctic this year have been up to 20 C higher than average, scientists are concerned that global warming is eroding the polar vortex (the powerful winds that once insulated the frozen north). Flow of warm air has heated Siberia up by as much as 35C above historical averages this month. Greenland has already experienced 61 hours above freezing in 2018, three times more than in any previous year. Intense heat waves are likely to hit most parts in India this summer, Chhattisgarh is already at 37 degree Celsius – 3 to 4 degrees higher than usual. The early onset of summer means higher probability of heat waves. India Meteorological Department (IMD) said, country faces hot weather during March to July but studies indicate increasing trends in the frequency and duration of heat waves over the country, which can be attributed to rise in emissions and the warming of the sea over the equatorial Indian and Pacific oceans. 21 young Americans are suing government agencies over climate inaction. A US court has rejected Trump’s attempt to block the case of kids who want government to cut the US emissions and end subsidies to fossil fuel companies. White House tried to slow down the case arguing that finding documents and interviewing people, was ‘too burdensome’.